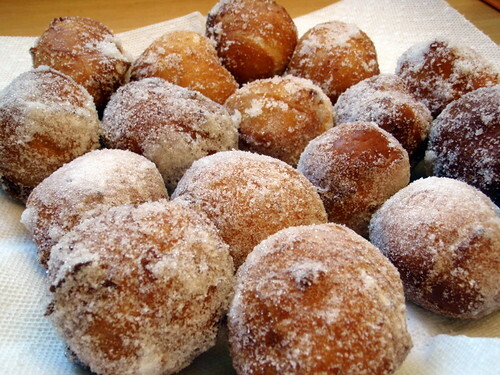 About a month ago, I got an e-mail from my brother with a link to a recipe for lilikoi malasadas. He asked if I thought they would be hard to make because he had had some in Hawaii and they were "amaaazing". I skimmed through the recipe quickly and replied, "Doesn't sound that hard as long as you can get me some unsweetened lilikoi (or passion fruit) concentrate and unsweetened guava concentrate. No idea where I'd even find that stuff.... Also, if you can get me a stand mixer with a dough hook, I'd be all set." And that was the end of that conversation. Until last week when I announced on Facebook that I had finally caved in and bought a KitchenAid stand mixer. While most of my friends were congratulating me on the purchase, Timmy's only comment was "can you try making those lilikoi malasadas now?" Can you tell he's a younger brother? There was still the issue of finding lilikoi concentrate and guava concentrate in the Boston area. I checked Shaws and Harvest and even Whole Foods with no luck. Then I looked on-line, and there were some suggestions of trying a local Brazilian grocery store, but then I saw some posts that mentioned I should be able to find it at Shaws in the frozen foods section where the Goya products are. So I went back to Shaws, and lo and behold, there was frozen passion fruit pulp! And when I went back to Harvest later on, I was able to find frozen guava pulp there! Now that I had all the ingredients and equipment I needed (I actually had to borrow a stand mixer from Susan because mine hadn't come in yet; thanks, Susan! ), I had no more excuses, so I spent this past Saturday making these beauties. 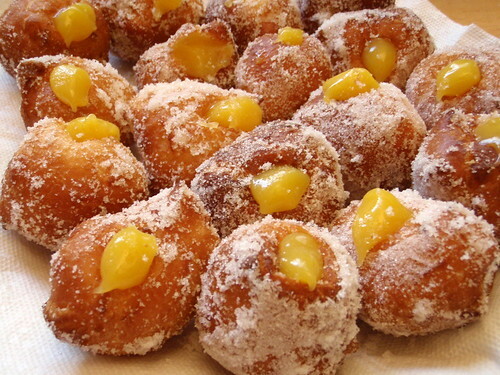 Note: this recipe does take quite a bit of time what with making the dough, letting it rise, then chilling it for 2 hours, then shaping and letting it rise again, then frying it, and finally filling the malasadas with the passion fruit curd. But it's so, so worth it, especially if you don't live in Hawaii and can't just buy these at a local bakery whenever you want. Also, I did make the guava coulis from the original recipe, but I thought the resulting coulis was way too watery, so I'm not including it here. The malasadas were more than fine without it. In a small saucepan, mix together the sugar, butter, lemon and lilikoi pulp; bring to a boil. In a small mixing bowl, whip the eggs yolks with 1/4 of the hot lilikoi mixture; pour the yolk mixture back to the saucepan. Simmer, uncovered, whisking continuously until thickened and starts to bubble. Do not allow the lilikoi curd to come to a to a full boil or the eggs will start curdling. Strain and chill. 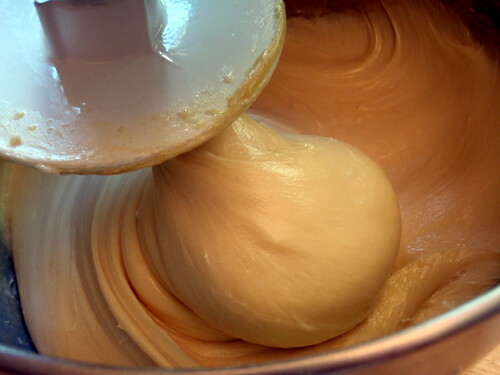 In a large bowl of an electric mixer use the dough hook to mix together the flour, sugar, and yeast. Mix in the eggs, one at a time to form a thick paste; continue to mix at medium speed for 15 more minutes, then add the salt. Add the softened butter, 1/2 cup at a time, while continuing to mix at medium speed. Transfer dough to a large bowl, cover, and allow to rise at room temperature until doubled in bulk. Refrigerate for 2 hours. Form the dough into 1-inch balls and allow it to rise once more at room temperature. Heat oil to 375°F. Fry the dough until golden brown. Drain on paper towels. Roll in sugar. 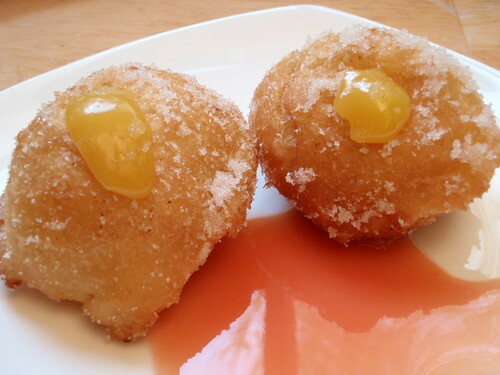 Fill the malasadas with the lilikoi curd using a pastry bag. The lilikoi curd is seriously one of the best things I have tasted in a long time. It's tart and sweet and buttery and custardy all at the same time, and you just want to start spreading it on everything. Then I tried a freshly fried malasada, and I knew the lilikoi curd had met its match. The outside was crispy from the frying and crunchy from the granulated sugar while the inside was soft and chewy and slightly sweet. I only wish I had been able to pipe in more of the lilikoi curd because the little squirt I got in there just wasn't enough. they were quite delicious! thanks for bringing them along to the party! My roommates and BF were so enamored with them! I also found myself at a Shaws yesterday, so I stopped by the "Goya"/hispanic section of the frozen aisle like you said, and stocked up on fruit pulp, hahah. I agree. I like the word "pudding" much better. @lmp - What are you going to do with them? I'm planning on making passion fruit ice cream with the rest of my passion fruit pulp! @Ryan - I completely agree, which is why I kept writing "lilikoi curd" instead of just "curd". I think "lilikoi" is such a fun word that it kind of neutralizes the grossness of "curd". Joy, these look fantastic! Do they keep well? I'm assuming they taste best fresh, right? Thanks for the tips about the passion & guava extracts/purees. Good to know they are all accessible within walking distance. Woo hoo! Oh goodness! I've never heard of these, but boy do I want to try this out!! The curd also sounds so refreshing and a great combination with the doughnuts. The dough looks so smooth and thick, too! I hope your brother is satisfied now haha. I want to see the new mixer when it comes in!! I love looking at new KA mixers! @TUK - Sorry, I have no idea how well they would keep. I gave away all the leftovers (which, looking back, was pretty stupid of me). But I'll try to ask around and see if they were as good the next day. These sound and look scruuuumptious! Thanks Joy for the amazing recipe! Just made a batch today, and they turned out soo good. You've made me a very happy Hawaiian in Seattle, thanks! Can't believe I found this recipe, moved from Oahu to North Carolina...it was a hit at my pa'ina! Liliquoi curd (or butter) as prepared in the above recipe is delicious as a spread on toast, bread, crackers, etc. I brought 10 jars back to the mainland with me for gifts. I watched a youtube video yesterday that prepared the dough for malasadas by stirring by hand. Apparently, this method keeps the dough from being tough. What are your thoughts on using this method? I'm a Taiwanese-American girl trying to cook like my mom and anything else that catches my fancy. Follow Joy's board The Cooking of Joy on Pinterest.